This article features a combined participatory bottom-up and top-down scenario methodology with results from the Barents region. It is the result of work carried out within program Mistra Arctic Sustainable Development and the Barents report for the Arctic Council project Adaptation Actions for a Changing Arctic. Embedding scenarios of global change in local and regional contexts can support the identification of local adaptation challenges. Comparability across local studies of adaptation challenges can be facilitated by using the Shared Socioeconomic Pathways (SSPs) from the global scenario framework developed by the climate research community as common boundary conditions for identifying most significant and uncertain dimensions to potential future change. 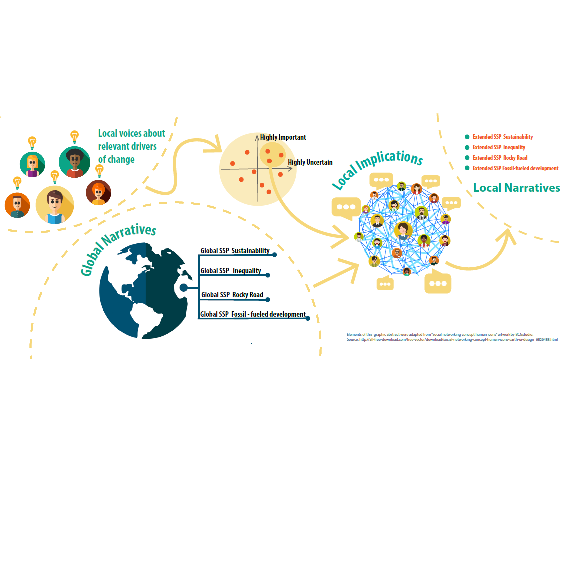 Participatory scenario workshops are useful for producing site-specific narratives that articulate how potential future global change is perceived by local and regional stakeholders and form the basis for so-called extended socioeconomic pathways. Results from four scenario workshops in the Barents region show that many local adaptation challenges relate to the global SSP elements but that an explicit local translation process, rather than simple downscaling, is fruitful for capturing the interactions with local and regional dynamics in terms of social, economic and cultural contexts.